"The 64 million ringgit question is, will the Government still support Proton now?" asks a motoring journalist on Facebook after Dr Mahathir initiated and signed the Citizens Declaration that calls on PM Najib Razak to resign. There are 12,000 Malaysians employed by Proton. 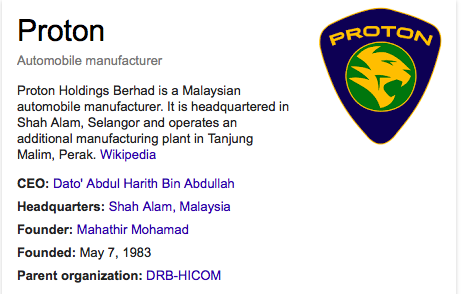 Apart from being the Founder, Tun Dr Mahahtir Mohamad is also Chairman of Proton. No, not Executive Chairman, for the Tun doesn't need fancy titles to execute anything (or anybody). His every wish is Harith's command. 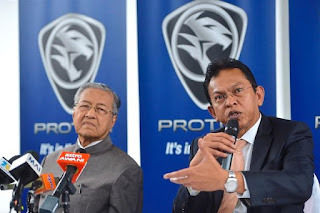 I'm sure even Syed Faisal Albar, the spanking new big boss of DRB-Hicom, is not going to get in the way of the Old Man where Proton is concerned. No point in making the same mistake TS Khamil Jamil once did. When Dr M took the chairmanship of Proton from Khamil back in May 2014, I told some people that I thought he shouldn't have. It could hold back the company. Even some people in Proton agree with me these days. Some, not all. Especially after the Citizens Declaration shocker last week involving Tun Mahathir and Lim Kit Siang, Azmin Ali, S. Ambiga, Mat Sabu, Zaman Khan, Ku Li, etc. I am not the only one wondering how many of the 12,000 Proton employees have signed or will sign their Founder and Chairman's so-called Citizens' Declaration. And how many won't. Proton is now a private company, after it was taken over by Syed Mokhtar AlBukhary's DRB-Hicom group, but its very existence still depends on government assistance, as has been the case since its inception. In fact, it is widely believed that Proton - or, rather, Najib Razak's reluctance to pour in more money into it as demanded by Dr M - is one of the reasons why the Tun is bent on getting rid of the son of Tun Razak for good. Things have not been looking up for a while in Proton. As it is, there are quite a few in Proton who blme Dr Mahathir for the company's woes. His problem is simply he learned from.his proton experiance to knock out Najib instead of putting proton on the right footing. Since he acknowledged not knowing what else to do, he should resign and allow those who know to lead. He is asking Najib to resign by claiming Najib failed on many areas. The problem may not be because Najib failed but he cannot understand. He has problems differentiating between reality and perception. Being the master in deception, he thinks what he perceive is reality and believe in his own lies and perception. In his days, he did many failures and bailed out his failures using public money. Najib knows what he is doing. He is not about to bailout using public money. Not when Madey is still there indifferent to market fundamental and insisting success in market is by pumping good public money into bad money. Both Proton & MAS should be closed down! Why drain public funds further? Let's get real. Proton will never be able to compete with Hyundai or Kia, let alone Honda, Nissan & Toyota. As for MAS, it's been overtaken & surpassed by Cathay Pacific, SIA and Qantas a long time ago. What's Khazanah spending more funds on it for? wow. never thought you can go this low. from supporting bersih 1.0 to oust Pak Lah to supporting Najib who commits triple the sins of Pak Lah. Good Luck. "When Dr M took the chairmanship of Proton from Khamil back in May 2104...."
Ummmmmmmm, isn't 2104 in the next century, and hence in the future? Did the Malay Mail reach the heady heights of quality of Proton, Abang Bru? I thought you might feel kindred values, i.e. faulty construction & poor QC. Although Proton has had those long before Tun arrived. How to remember what position you're supposed to take. Refer to HQ, I guess. The shifting quicksands of paid professionalism have ensnared me. If PAS, MIC, MCA, PPP or DAP makes me an offer, hey. Years ago you were defending Proton when Tun was the advisor. You should look back what you said about Tun back then. I guess this is okay. Pak Lah sacked you when you did not like Pak Lah that much back then. Government should not help Proton too. Blackmailing 12,000 staff not to support Tun just because he doesn't like Najib is now second nature for Najib and his writers. So Tun M should be sacked now, because this cruel Government will not stop being nasty towards the innocent 12,000 people. I am still defending Proton lah. I have always defended Proton. Thank you for pointing out the 100-year mistake.